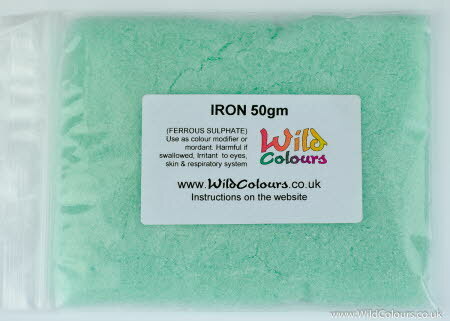 Iron (ferrous sulphate) 50 gram pack for modifying dye colours and mordanting cotton & linen. Iron is sold and used as its soluble salt, ferrous sulphate. Iron (ferrous sulphate) is weighed and sealed in a polythene bag. The bag is then labelled, placed in a padded envelope and posted to you First Class.